Matthew C. Nisbet, Ph.D. is Associate Professor of Communication Studies and Affiliate Associate Professor of Public Policy and Urban Affairs at Northeastern University. He is Editor-in-Chief of The Oxford Encyclopedia of Climate Change Communication, and a consulting science communication researcher to the American Association for the Advancement of Science. He has served previously on the faculty at American University and The Ohio State University. Nisbet studies the role of communication, media, and public opinion in debates over science, technology, and the environment. The author of more than 70 peer-reviewed studies, scholarly book chapters, and reports, he holds a Ph.D. and M.S. in Communication from Cornell University and a BA in Government from Dartmouth College. 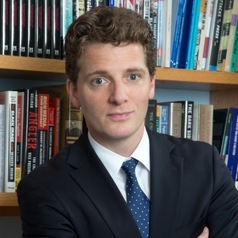 Among awards and recognition, he has been a Visiting Shorenstein Fellow at Harvard University’s Kennedy School of Government, a Health Policy Investigator at the Robert Wood Johnson Foundation, a Google Science Communication Fellow, and is currently a member of the National Academies Roundtable Committee on Public Interfaces in the Life Sciences. He serves on the editorial boards for Public Understanding of Science, The Oxford Research Encyclopedia Climate Science, and the International Journal of Press/Politics, and is a past member of the editorial board at Science Communication. He is an affiliated researcher with the Climate Change Institute at the University of Maine and the Center for Climate Change Communication at George Mason University. According to Reuters Web of Knowledge, Nisbet’s research has been cited in the peer-reviewed literature more than 1750 times (H-Index = 22), and according to Google Scholar more than 5300 times (H-Index = 33). In terms of scholarly impact, these metrics rank him among the top 1 percent of communication researchers worldwide. Nisbet’s research has been funded by the Robert Wood Johnson Foundation, MacArthur Foundation, and Nathan Cummings Foundation. His consulting experience includes analysis on behalf of the National Academies, the Howard Hughes Medical Institute, the Corporation for Public Broadcasting, the Centers for Disease Control, and other public and private sector clients. A frequently invited speaker, he has given lectures on more than four dozen university and college campuses worldwide and at many other scholarly and professional meetings.